What does the future hold for photojournalism? "We haven't quite worked out the business model in the new world." Effective photojournalism is about capturing striking images that represent a broader story, and sometimes demands bravery in the face of danger. Examples are scattered through photographic history: Dorothea Lange's images of 1930s Depression-era America, Robert Capa's visceral shots of the D-Day landings in World War 2, Sir Don McCullin's reportage from the frontline of the Vietnam War, and Sebastião Salgado's provocative images of Brazilian gold miners in the 1980s. Photojournalists have undoubtedly produced some of the most powerful and memorable pictures in the history of photography. In recent years, the continuing power of the still photograph has been demonstrated by standout images – images such as Nilufer Demir's 2015 photographs of Aylan Kurdi, the three-year-old Syrian refugee who drowned in the Mediterranean Sea and was washed up on a Turkish beach, and Jonathan Bachman’s 2016 image of a lone woman standing serenely in front of riot police at a Black Lives Matter protest in Baton Rouge, Louisiana – were shown across the media, and had a huge worldwide impact. Despite the success of high-profile images, today's photojournalists are facing an industry crisis. The circulations of printed newspapers and magazines are continuing to decline, so far fewer photojournalists are being paid to cover conflict zones and natural disasters, or to delve into social issues. For WPPh's Lars Boering, the disruption of the established business model is the biggest threat to photojournalism's future. "The main issue is the crisis of the media, not the crisis of photojournalism itself," he says. "Although we still see a lot of newspapers and magazines, the transformation towards using screens has almost been completed. Not all photojournalists can continue to make a living any more. There's not enough money for everybody." "If you want to monetise visual journalism, video wins," Lars continues. "Big media organisations say video is five times easier to monetise than photography [because of its advertising opportunities], which is very telling. Also, at this time, video plays a very big role in visual storytelling and visual journalism. That means photojournalism has to redefine its platform in many ways and has to find a place where the value of photojournalism can really shine." Stephen says he realised how quickly photojournalism was changing when he started running VII photo agency in 2008. Old models such as day rates for photographers and licensing, from which the agency earned commission, were already gone. Yet at the same time, individual photographers were doing quite well – they were busy selling prints, leading workshops and getting grants and bursaries. Stephen sees this as part of an overall shift in which value moved from the photograph to the photographer. "It's a business, so photojournalists need to be business people." His views are echoed by Lars. 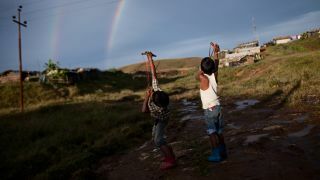 "Lots of good photojournalists are now creating their own social media platforms, which are connected to other big platforms that have millions of followers," he says. National Geographic photojournalist David Guttenfelder, for example, has over 1.1 million followers on Instagram. "Some also create their own foundations that do good, whether they are concerned with the environment, nature or even refugees. In a way, these photographers have a bigger reach than ever before. Through the foundations they are able to get commercial work and sustain themselves in a way that's totally within their control." As Lars explains, photojournalism has historically been an industry of half-products, and now the end product has evolved, as have the producers of that product. "Until now, photographers shot the images and then the magazine, newspaper or website wrote the story around it," he says. "Now, being in control means that photographers are producing an end product [by also writing stories, shooting video or producing other media to accompany their stills], which is being acquired by others. Who you are and what you do are being sought after. It's a business, so photojournalists need to be business people, then they'll have a far better chance of making it than just depending on an editor to call them. I think what's happening is the liberation of photographers – it's part of the growing up of this industry." "I see the future of photojournalism as very positive, and different in what it wants to achieve." In a fast-changing media world, you have to adapt to survive, and photojournalism is entering a new era. "I see the future of photojournalism as very positive, and different in what it wants to achieve," says Stephen. "In the past, you were a photojournalist if you sold pictures to print publications. "Now, if you only sell pictures to a print publication, you're not doing a great job. You should be doing other things with your life – maybe [take pictures for newspapers and magazines] four days a week, but on the fifth day you should do something else, such as making a documentary or doing some not-for-profit work. There are lots of ways of being effective in the world – it's not just about being in print." Whether photojournalism will sink or swim in this new age remains to be seen. When asked whether he's optimistic about its future, Lars is realistic about the challenges that lie ahead. "I'm very optimistic about visual storytelling, which is avoiding the question a little bit," Lars says. "All the new technology we see is really threatening the status quo for photojournalism and still photography. But if still photography connects itself to design and any creative means possible, then it can be the centrepiece. "So, if you talk about visual journalistic storytelling, then the future is super bright. World Press Photo's tagline, 'connecting the world to the stories that matter', is always going to work, and we prove it on a daily basis. But if you only talk about still photography, be careful, I would say. I don't think it has a life of its own in the future. But if photojournalism is powerful enough and good enough, then it's something that will always be able to play an important role."